Click above to see larger version. There are some significant changes coming to Metro Rapid Bus service in the San Fernando Valley on Dec. 14th as part of Metro’s twice-yearly service changes. The gist of it: there are two new lines beginning that day, the 744 and the Valley-Westside Express. The new lines are replacing service provided by two lines that are going away, the 741 and 761. •The 744 combines the existing 741 and 761 routes to form a ‘U’ shaped route that provides Rapid Bus service on Reseda, Ventura and Van Nuys boulevards — making travel along those corridors more seamless. •The Valley-Westside Express is a peak hour weekday service that will travel between Arleta/Panorama City and Westwood, using the HOV lanes on the 405 freeway to travel over the Sepulveda Pass. •The existing 734 Rapid Bus is being expanded to Westwood on weekdays and will supply local service south of Ventura Boulevard, along Sepulveda Boulevard, that is currently offered by the 761. Late night, early morning and weekend service to Westwood will be provided by Local Bus 234. The 734, 744 and Valley-Westside Express are also easy to reach via the Orange Line. Keep in mind, too, that Metro riders get two hours of free transfers when using a TAP card to pay the regular $1.75 fare, making it easy to transfer between the lines and to/from Metro Local Bus service. The service changes were developed by Metro in consultation with the San Fernando Valley Service Council. All service changes taking effect Dec. 14 can be found here. All timetables that are changing on Dec. 14 can be found here. The full timetables for the 734, 744 and Valley-Westside Express are posted after the jump. Go for a (video) ride on the Gold Line Foothill Extension from Arcadia to Azusa! Would you happen to have the updated 234 time table? Yo you got the new timetable for the 704?! I do not. Let me check to see if there are any changes to the 704. The change is more evening service between Santa Monica and downtown L.A. The geography of the area really hinders accessing the SB carpool lane. But I can’t really see any other good way to easily get 60′ artics or 45′ standards over to that lane without the large double back to Victory Blvd. Burbank is too close for rush hour, and the same goes for entering the 101 at Van Nuys Blvd. I agree, especially for non-English speakers. How do you translate “Valley Westside Express” in Spanish, Armenian, Russian, Japanese, Chinese, or any of the other mandated Title VI languages? Numbers are universal, and colors are universal. The Expo Line has an “E” in the middle of the circle which can be distinguished by anyone with familiarity with a Latin alphabet. Stick with numbers rather than fancy names, Metro. 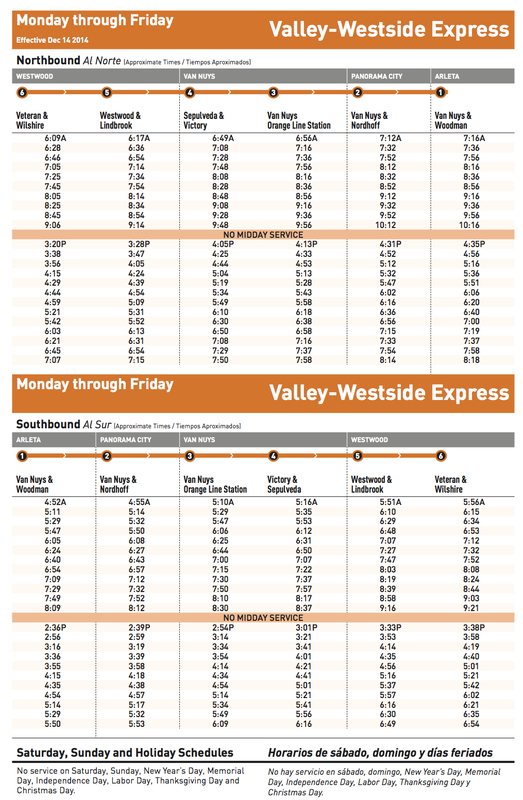 So a ride on the “Valley Westside Express” costs the $1.75 Metro base fare, or are there additional Express charges levied on the fare like the other Metro Express buses? It’s the regular $1.75 fare to ride the Valley-Westside Express. Once again, Metro displays its refusal to serve the underserved communities of Pacoima and Arleta. Instead of adding greater access to already overcrowded buses they continue to pull away service. Metro should focus instead on building a method for the areas residents to reach jobs. Shame on you metro! It certainly is a sneaky change to run the 162 branch of the 163/Sherman Way every day, which slashes service east of Lankershim on Sherman Way in half. The transfer is kind of annoying but the 224 has fairly frequent service. However they did add the Valley/Westside Express to Arleta, and notable is that there are no passenger restrictions on that bus. In other words you can ride the 788 locally to Orange Line for connections to Warner Center and North Hollywood. But how many people know that? How many people will let the “Valley Westside Express” bus pass by even though they may be going to Downtown Van Nuys or Orange Line, because they are turned off by the name, and jam up the 744 and 233 instead? How many drivers will remember that they have to pick up passengers northbound in the Valley? This is why going with the 788 as the line number is better. Is the atypical name of the new “Valley-Westside Express” indicative of a new naming scheme for Express lines (which are/were supposed to be numbered in the 400s/500s and use blue-colored buses and schedules)? Or is there something unique about this particular line that warrants an atypical naming convention? The Valley-Westside Express needs to be heavily promoted to make people who normally drive to UCLA aware of this faster more direct bus line. Otherwise it could turn out to be a big flop. Metro needs to plaster the buses with messages about the line so that drivers on the 405 can know where its going. The easiest and most important part of the promotion would probably be getting people aware at UCLA that this is available for them if they live in the San Fernando Valley. There is as much motor vehicle parking at the Orange Line Van Nuys and Sepulveda stations along this bus route as there is at the two subway stations in the valley. Making drivers aware that a abundance of parking spaces is available at these two Orange Line stations is a key ingredient to making this line successful. Always glad to see Metro taking advantage of these new-fangled “Freeways” that the State Department of Highways has been planning and building. Starting at the Orange Line Sepulveda station, Line 788 Valley-Westside Express only saves 8 minutes of travel time to the final destination of Veteran/Wilshire compared to Line 734, even though it has much fewer stops and most of the trip length is on the 405 freeway instead of Sepulveda Blvd–which Line 734 travels on. How is that possible? The ad for the Valley-Westside Express on this Metro website states that it will save 20-minutes over the Sepulveda Pass. How is that possible when it only saves 8-minutes compared to Line 734 which travels on Sepulveda Blvd and makes many more stops? It’s because the twenty-minute savings to Wilshire/Veteran comes from the coach stopping there right after exiting the freeway (or I hope that what it does). The timetable listing for Veteran/Wilshire is after the coach takes a loop around Westwood Village to drop people off at Westwood/Lindbrook, then ends the run at the Federal Building. It looks like new schedules are cutting service on the #2 to pacific palisades. Why is this information not included on the “service changes” graphic? very deceptive metro. Are there any other adjustments that we need to know about other than in the valley? 744 timetable being listed as eastbound and westbound is confusing since only 5 of the line’s 35 stops are in the east/west direction…. but the bus that was going South on Van Nuys goes North on Reseda which is even more confusing. I guess you win some and you lose some with the 744 change. Mid-day service is going from 30 minute headway to 20 minute headway on the Reseda corridor, but morning and afternoon service is going from 15 minute headway to 20 minute headway. I’d prefer a constant 20 minute headway over the 30 minute headways that were in place before, so I’m a fan of this idea. Still in need of more public outreach however, as I mentioned in my tweets last week. Hear Hear Phantom Commuter! There should be some way of getting from Westwood to the Valley 24/7.